Tim Baker recently attended the ECG Conference in Scarborough and was challenged to be bold and turn his calendar inside out! More than £340,000 has been given in response to the East Africa Famine Appeal and lives are being saved. Do you ever feel mentally exhausted when you turn on the news or pick up a paper? A blog about the East Africa Famine Appeal and why we really can make a difference – even in the face of such need. Why All We Can’s work is featured in the Pink Lady Food Photographer of Year shortlist and some thoughts on food and poverty. Revd. Gail Hunt explains why Gracious Street Methodist Church responded to the East Africa Famine Appeal. 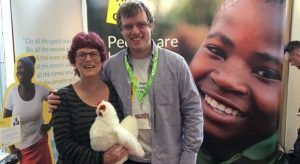 “As Regina spoke, tears rolled down my face uncontrollably” – Graeme Hodge, All We Can’s Deputy CEO, describes the emotional day he met Regina in Cameroon. Have you ever used the phrase, “I’m starving”? Reflections on the famine in South Sudan. Can the world feed itself by 2030? Valeria Llano-Arias finds out more about food and our future.